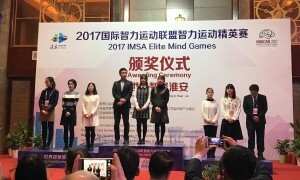 This exciting game is from the 2017 IMSA Elite Mind Games women’s team tournament. Already by the 3rd move, Sarah Yu shows her intention to avoid calm and normal go, and then sacrifices stones and starts kos. Her strategy works as she attains a promising position, only to make a slip in time pressure, leading to a complicated winner-take-all ending. Sarah gives her impressions of this game and her entire experience surrounding the competition: “This game was the last round in women’s team. I truly enjoyed this game, and came to see the difference of skills between myself and my opponent. I am privileged to have become a part of it. And I am honoured to represent North America in this high standard tournament. Overall, I am pleased with the games I played. “This year’s IEMG was in structure similar to the one in March 2016. For Go this year, both men and women played in team of two. After the team tournament, one would play in individual blitz, and the other player in pair Go. “Sometimes I found myself asking, what was my role in this? This year, my goal was to enjoy the tournament, the side events, and to connect a little with other players. I am also grateful for the opportunity to open my eyes in other areas, such as tea tasting, calligraphy, and draughts. 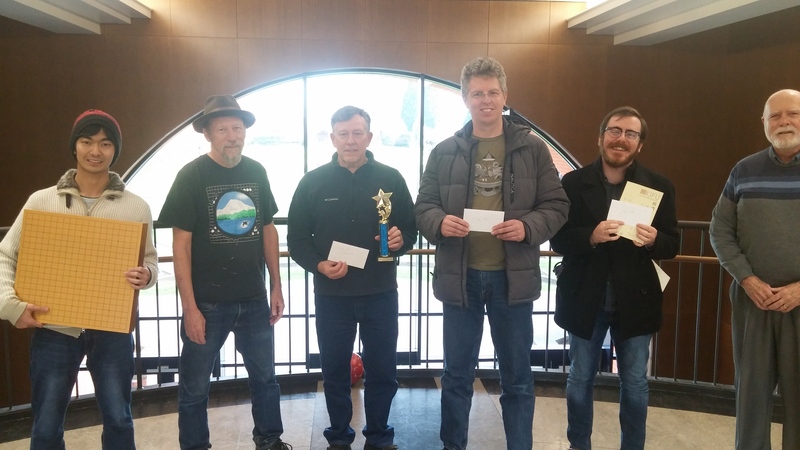 The 5th Annual Gala Pair Go Tournament, held Saturday Dec. 16 in Seattle, had lots of laughter, and stronger players than 2016. Although the 2017 group was a little bit smaller than the previous year, with 11 teams, they managed to eat almost all the cake, and to polish off the raspberries and cream. The first table was won by Lusha Zhou and Tzu-Jen Chan. 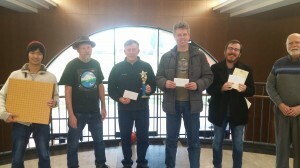 The second table was won by Cat Mai and Nick Wilmes, while the third table was won by Anne Thompson and Bill Thompson. The games inspired much discussion, and pairs were still replaying their games an hour after the awards ceremony. 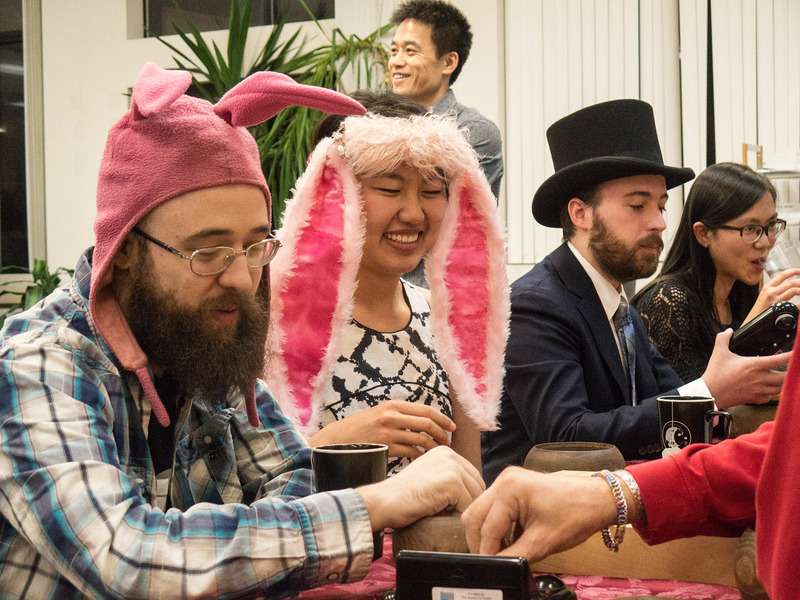 photos: (right) Cullen Mott and Lucy Wang in rabbit ears; (left): first table winners on left, second table winners on right, third table winners in center front. Photos and report by Brian Allen. 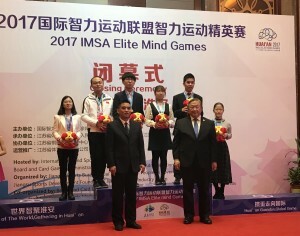 The go activities during last two days of the IMSA Elite Mind Games included three medal competitions: pair go, men’s blitz and women’s blitz. The format for these tournaments were new: the six teams were divided into three tiers, China and Korea, Japan and Taiwan, Europe and America. Then one team from each tier is drawn to form a group of three teams. In the first day, each group play within the group to determine the three teams’ position. Then in the second day, the top four teams from the two groups play two rounds to determine the top four finishers, while the two third place teams play to decide the 5th and 6th places. 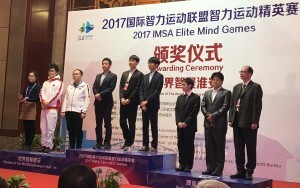 In the end, Ke Jie from China won the men’s blitz, while Korea took the two other gold. Japan won all four bronze medals, a surprisingly good result. Canadian pair Sarah Yu and Ziyang Hu (at left in photo above right) played hard to narrowly defeat Manja Marz and Mateusz Surma (above right) and took a valuable, lone, 5th place for the American team. 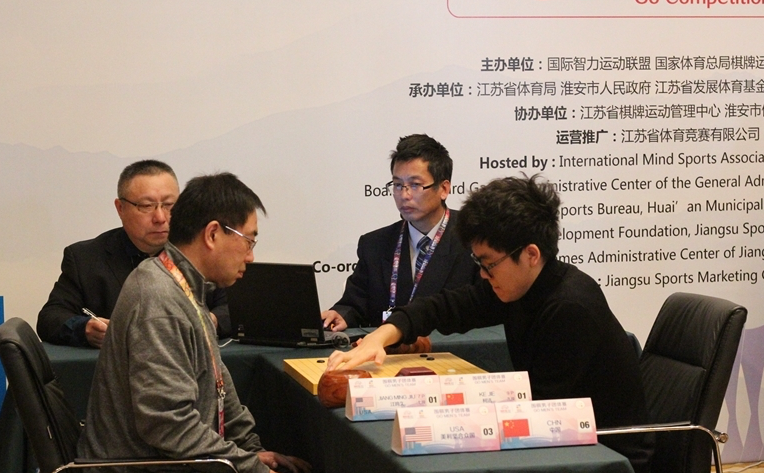 Wan Chen lost to Manja Marz of Germany, and Mingjiu Jiang forfeited his game with Ilya Shikshin. 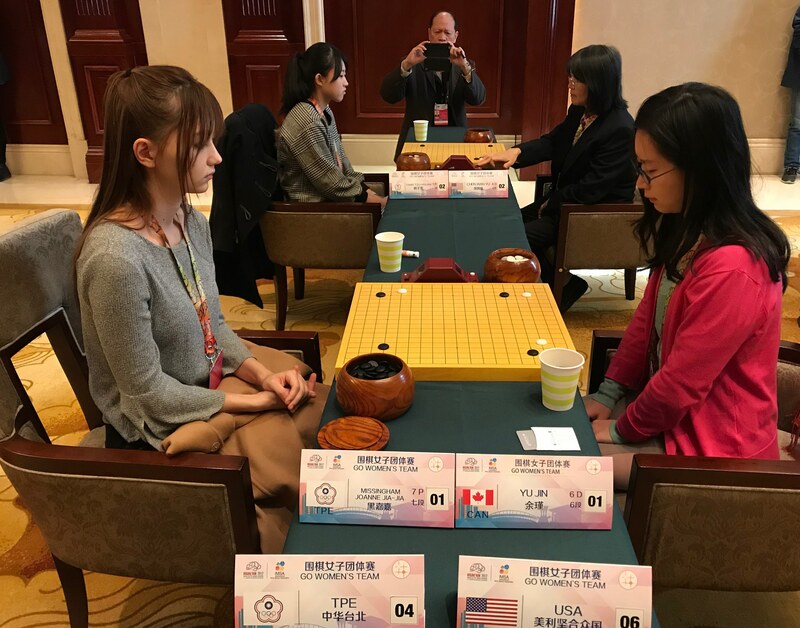 For the whole event, Ziyang Hu was the top performer from America’s team, winning two games – one against Surma in team play and one in pair go. 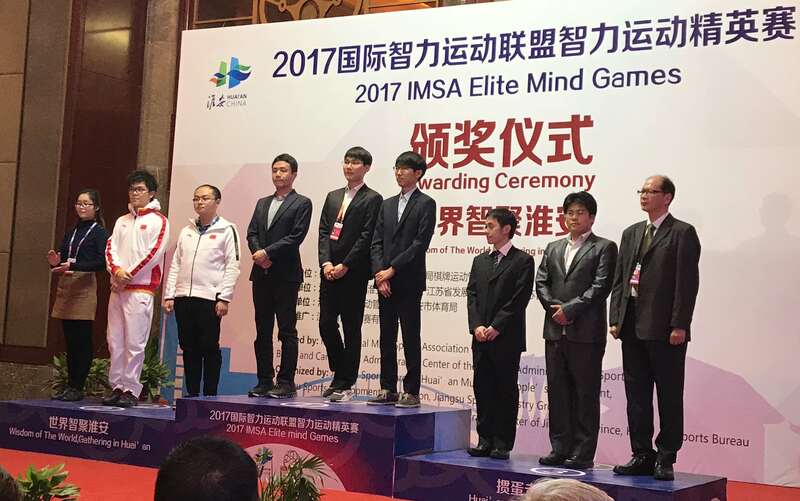 During the closing ceremony, medals were awarded in all five mind sports represented by IMSA. China and Russia were the big winners, followed by Ukraine and Korea. It was announced that the next chapter of this event will likely be held in mid-November, 2018. It is expected that the final details will be announced in February next year. The last day of women’s team competition saw plenty of sparks, but the only surprising result was Fujisawa Rina defeating the world’s top-ranked female player from China, Yu Zhiying. Japan was then in a position to tie or defeat China, depending on the outcome of the other game bewteen China’s Lu Minquan and Japan’s Nyu Eiko. In that a game, Nyu played well to be ahead for most of the game, but she slipped in the yose when both players were in byo-yomi. After 6+ hours of play, the score was an unusual W+1.5 point due to a single-shared-liberty seki. Another game that could have sent shockwave through the tournament was between Canada’s Sarah Yu and Korea’s Choi Jeong. Sarah was in a difficult position from the start, but she fought hard and was about to win a large-group semeai with a favorable yose-ko. Sarah was in byo-yomi and could not read in out, missing her chance. She missed a second chance to create a triple ko, which would have tied the game according to the tournament rules. As a result, Korea took first place, China dropped to second, and Japan received a hard-earned bronze medal. On the men’s side, the games were all lopsided. Taipei could not follow its previous day’s performance and lost to Korea 0-2. In the end Korea was first, China second, and Taipei third. Tomorrow the action switches to Pair Go and men’s and women’s blitz go. In two days, there will be three more medals to be won. For all three tournaments, the first day will be a three-round preliminary. 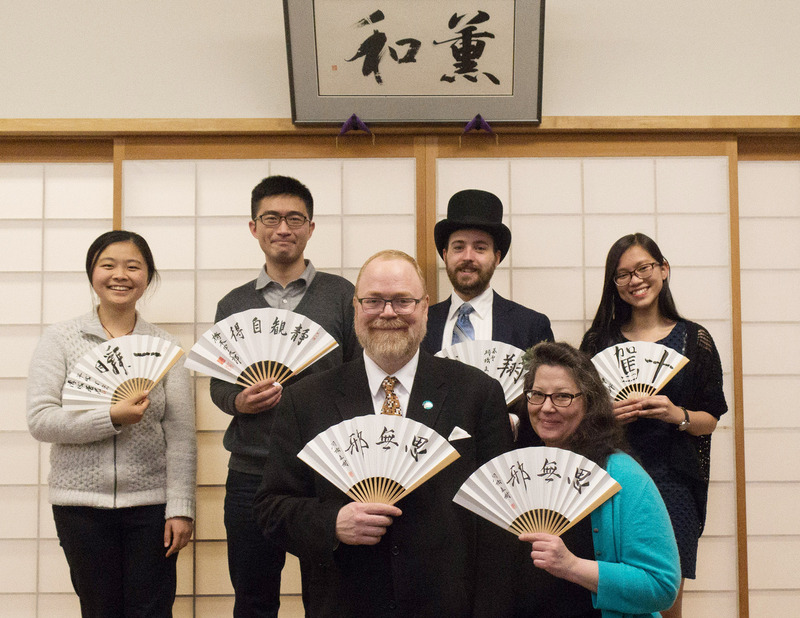 Participants are divided into two groups. Preset seedings separate China and Korea, Japan and Taipei, North American and Europe into the two groups. The groups’ top finishers will meet to determine 1st and 2nd place, etc, in the second day. 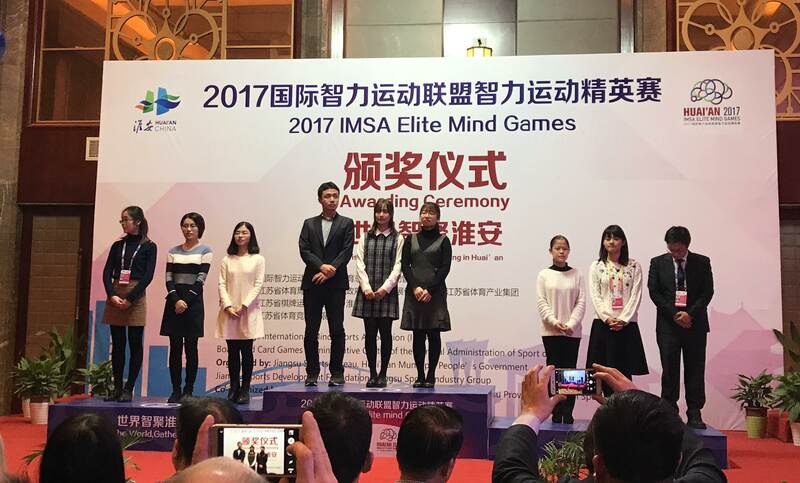 In today’s IMSA Elite Mind Games team competitions for both men and women, China drew North America, Korea drew Europe, and Taipei drew Japan. China and Korea easily defeated their opponents to win 4-0; the suspense was with the closely matched games between Taipei and Japan. For men, the top two Taiwanese players Wang Yuan-Jyun and Chen Shih-Yuan defeated Japan’s new stars Shibano Toramaru and Mutsuura Yuta. For women, much attention was focused on the match between Joanne Missingham (Hei Jia-Jia) and the multiple title winner Fujisawa Rina (granddaughter of Fujisawa Shuko). The game lasted over five hours, with Rina finally prevailing over the seemingly rusty Joanne. The other game featured two shodans, the 15-year old Yang Tzu-Hsuan and the 17-year old Nyu Eiko, both having reached major title challenges this year in their countries. Eiko, daughter of multi-time world xiangqi champion Zhao Guorong and Go 5p Niu Lili who is famous for have written Go Seigen’s books for the past 20+ years, calmly won over Tzu-Hsuan in their first of many anticipated matches to come. 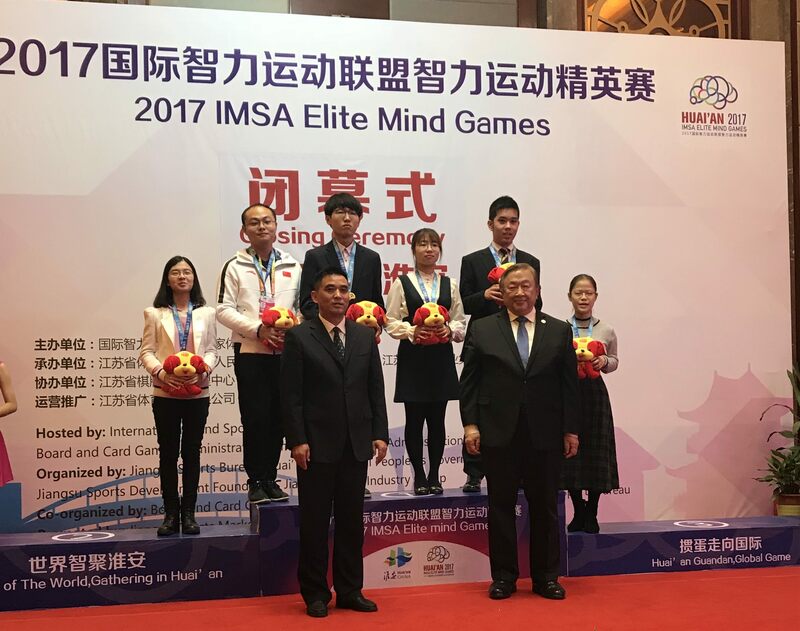 For readers who are not familiar with the IMSA Elite Mind Games, this event is a replacement of the previous SportAccord World Mind Games held from 2011 to 2014. A unique feature of these events is their strong involvement of Western players. 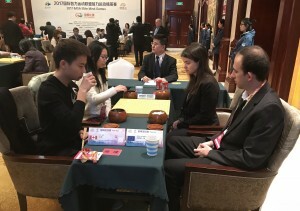 Not only is the prize fund spread out to all players, the format of play, which does not use simple knock-outs, also allows the Western players to play many games with the top pros from Asia, thus allowing valuable training experience for the former. In today’s IMSA Executive Meeting, it was announced that IEMG will be continued for at least another two years. In addition, new events are being developed, aiming to hopefully reach three IMSA events per year by 2019. 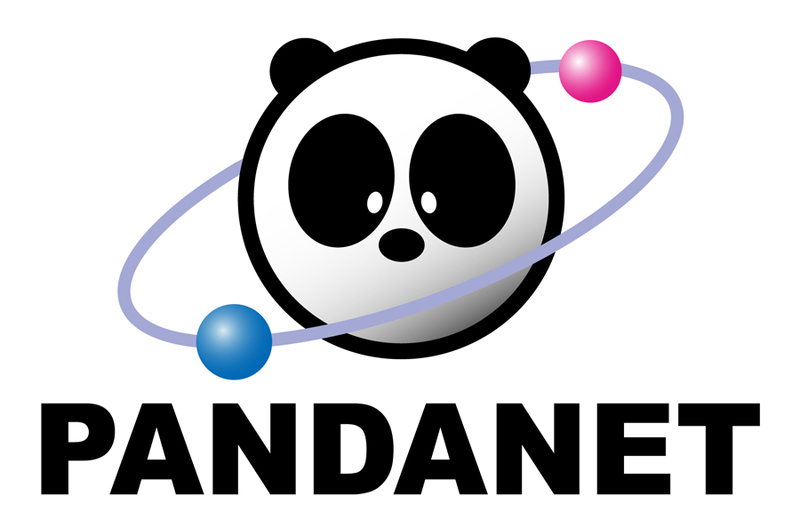 Registration for the sixth year of the Pandanet AGA City League is upon us. If you are interested please read the rules page and send an email to steve.colburn@usgo.org. Registration will close on November 30th.